The Leeds and Liverpool Canal was built between 1770 and 1816. Its route through Burnley (opened 1801) includes the Burnley Embankment known locally as "the straight mile" - one of the seven wonders of the British waterways system. In the Weavers' Triangle, cotton mills line the canal, which not only provided transport for cotton and coal but also water for the steam engines that powered the machinery. The stone warehouse at Burnley Wharf was built in 1801. The other warehouses were added later in the century. Today, the complex has been restored for use as an inn, offices and the Weavers' Triangle Visitor Centre. 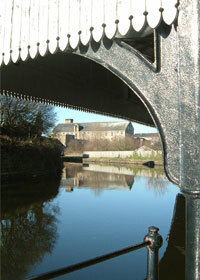 At the centre, you can look around Burnley Canal Toll Office where tolls were paid for the Leeds and Liverpool Canal. The toll office was in operation until the 1950s and has been restored to how it would have looked when it was in use. There are also displays charting the history of the canal across the region. The walks start at 2.15pm at the Weavers Triangle Visitor Centre. Guided walks can also be arranged at other times as part of a group visit. Level access to the towpath. Disabled parking at Burnley Wharf. Click here for maps and travel information.